If you think you know the story, think again. Experience the film that critics and audiences are raving about when The Cabin In The Woods arrives on Blu-ray Disc (plus Digital Copy), DVD (plus Digital Copy) and On Demand and Pay-Per-View September 18 from Lionsgate. The Cabin In The Woods will also be available on EST September 4, two weeks prior to the Blu-ray, DVD and On Demand release. Co-written by fan favorites, Joss Whedon (The Avengers, TV's "Buffy The Vampire Slayer") and Drew Goddard (Cloverfield) and directed by Goddard, The Cabin In The Woods is a film that "horror fans will be gushing about for years" (FearNet). Starring Kristen Connolly (The Happening), Chris Hemsworth (The Avengers), Anna Hutchison (TV's Wendy Wu: Homecoming Warrior), Fran Kranz (The Village), Jesse Williams (TV's "Grey's Anatomy"), Richard Jenkins (The Visitor) and Bradley Whitford (TV's "The West Wing"), The Cabin In The Woods is not like any horror movie you have seen before. Both formats come complete with a must-have behind-the-scenes "making of" featurette along with numerous additional featurettes that focus on the make-up, effects, animatronics and more, audio commentary with Writer/Director Drew Goddard and Writer/Producer Joss Whedon and the Wonder-Con Q&A, while the Blu-ray Disc includes the exclusive"It's Not What You Think: The Cabin in the Woods" Bonus View Mode. The Wonder-Con Q&A will also be available on Digital Download. 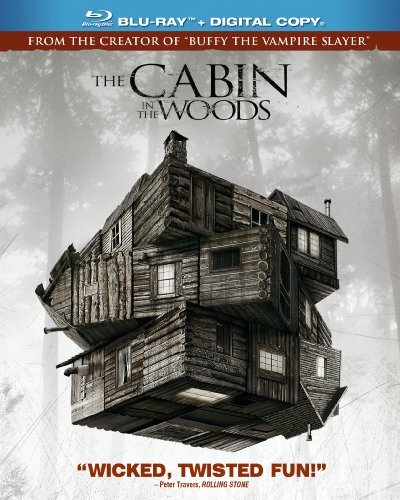 The Cabin In The Woods Blu-ray Disc (plus Digital Copy) and DVD (plus Digital Copy) will be available for the suggested retail price of $39.99 and $29.95, respectively. Title Copyright: The Cabin in the Woods, Artwork & Supplementary Materials (c) 2012 Lions Gate Entertainment Inc. All Rights Reserved. Lionsgate is a leading global entertainment company with a strong and diversified presence in motion picture production and distribution, television programming and syndication, home entertainment, family entertainment, digital distribution, new channel platforms and international distribution and sales. The Company has built a strong television presence in production of primetime cable and broadcast network series, distribution and syndication of programming and an array of channel assets. Lionsgate currently has 16 shows on more than 10 networks spanning its primetime production, distribution and syndication businesses, including such critically-acclaimed hits as the multiple Emmy Award-winning "Mad Men," "Weeds" and "Nurse Jackie," along with the powerful drama "Boss," the new network series "Nashville" and "Next Caller," the syndication successes "Tyler Perry's House of Payne," its spinoff "Meet the Browns," "The Wendy Williams Show" and "Are We There Yet?" and the upcoming "Anger Management," starring Charlie Sheen, and "Orange is the New Black," an original series for Netflix. Its feature film business has been fueled by such recent successes as the blockbuster first installment of "The Hunger Games" franchise, which has already grossed nearly $650 million at the worldwide box office, "The Expendables," "The Lincoln Lawyer," "Cabin In The Woods," "Tyler Perry's Madea's Big Happy Family" and "Margin Call." With the January 2012 acquisition of Summit Entertainment, the Company now has the two leading young adult franchises - the blockbuster "Twilight Saga," which has grossed more than $2.5 billion at the worldwide box office, and "The Hunger Games." Recent Summit hits include "Red," "Letters to Juliet," "Knowing," the "Step Up" franchise and the Academy Award-winning Best Picture, "The Hurt Locker."